Chaat masala is a tangy blend of spices that is used to perk up various street foods or 'chaats'. The masala has a distinguished taste of hing (asafoetida), black salt (sanchal) and dried mango powder that gives it the tanginess. Because of this unique taste it is sprinkled over many fruits to counter the sweetness and add a bit of zing to their taste. Many will assume that classic recipes in which we use Chaat Masala are limited but that’s not true. For decades now chaat masala is being used in multiple ways all over India. As the name suggests, it is used abundantly in various chaats, ie street foods, like Bhel Puri and Chana Chaat. It gives a sour/tangy taste to the mix of rice puffs and chana which is just right to the palate. This masala mix is not only added to the basic chaats but also to many other types with varying ingredients like Aloo Chaat, Pani puri and even Dahi papdi chaat. Growing up I never had fancy desserts post dinner but I had an ultimate favorite one that almost every 90's kid had growing up, a Fruit Chaat. The combination of oranges, apples, bananas and really any fruit we could find sprinkled with loads of chaat masala to cut through the sweetness was my ultimate guilty pleasure. That is when I started to love this masala and wanted to sprinkle it on everything I could lay my hands on. Once I figured out my love for this ingredient, there was no stopping. But as it turns out, everyone was already doing that! Chaat masala was sprinkled over garam garam bhajiyas and vadas in the rains like the Masala sweet corn vada, or over the crispy Onion rings in restaurants. The basic side dish of sliced onions along with Punjabi food is perked up with lemon and masala as well. Indian street food is a mix of flavors of different cuisines combined together to form absolutely delicious dishes that you keep craving. Add chaat masala to them and they become all the more irresistible! Potato Cheese Grilled Sandwich is ideal for our desi palate. With gooey cheese, tangy masala and spicy chutney, it’s the best hunger solver. Never did we think of combining Chinese flavors with chaat masala but here it is! Schezwan Noodle Frankie is different and delicious where chaat masala adds a punch to the whole dish. Just like you can add chaat masala on fruits, you can add them to juices as well. Add a dash to Pineapple juice to enhance its flavor! Vegetarian American burgers can be spiced up by adding Indian flavors to it. Make the patty of Spicy Paneer Burger a little chatpata by adding chaat and garam masala to the mixture which will make it even tastier! Make a simple aloo chaat and place it inside small taco shells to get a unique party starter – Aloo Chaat Tacos. The flavor of jeera in the masala really complements paneer, so to add the masala to paneer subzis makes them even better. In Tava Paneer, Mushroom and Green Pea Subzi, we first marinate the veggies in masala and then cook it to get extra flavor. 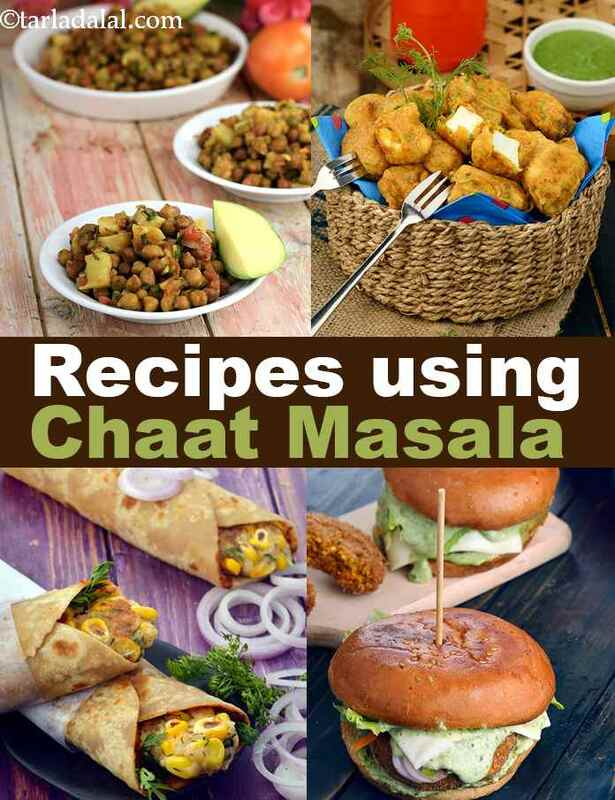 If you want to know more about the Uses of Chaat Masala, you can check out our article on that. Two of my favourite ingredients join hands here to make a fibre-rich feast for my little buddies! This is indeed a healthy choice of chaat as it is full of healthy ingredients like green peas, vegetables and corn, flavoured with khatti-meethi chutney. Vitamin E and folic acid rich spinach added to these delicious kebabs doing wonders for your eyes.